After seven years of being a purely one-to-one video connection, FaceTime has been redesigned to support calls with up to 32 participants, which can include clients using macOS Mojave, iOS 12 or even watchOS 5 Apple Watch users via FaceTime audio. In the new Mojave Public Beta, FaceTime is still very much a work in progress. 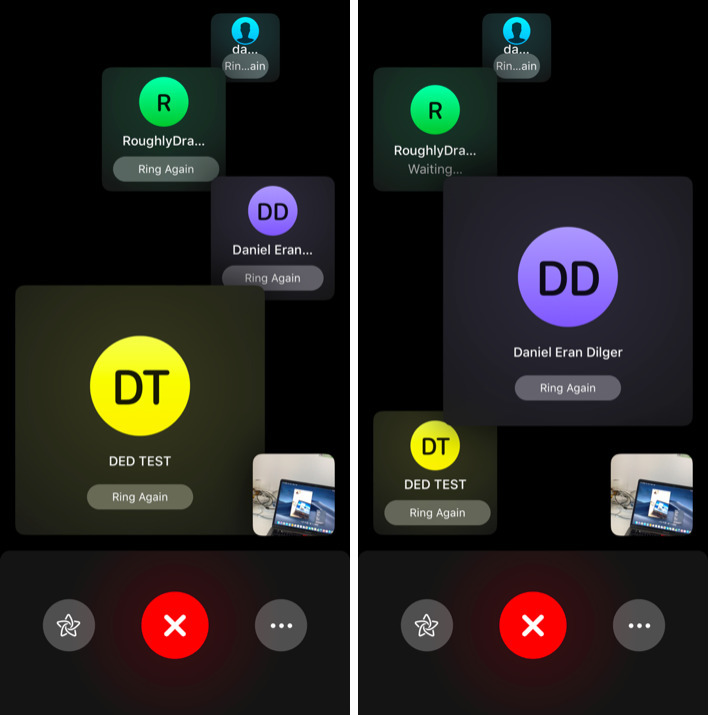 It's possible to successfully connect with an iOS 12 FaceTime user (and also a Mac user running on High Sierra), but while you can see the new multiuser interface, connecting with groups of users still appears to not yet be functional. The existing FaceTime 4.0 in macOS High Sierra doesn't have any concept of calls with more than one other person. If you invite multiple callers to a call, it won't even ring. Previous FaceTime call records that involve multiple parties show up on older Macs as being made to a "Unknown" caller, and High Sierra can't attempt to call them back. 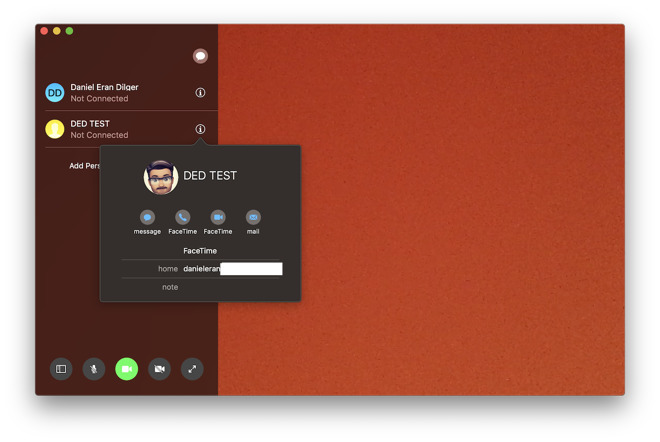 You can expect that calls with multiple FaceTime participants will require a Mojave upgrade (and that older Macs won't be able to join), but it appears that existing Macs will still be able to FaceTime one-on-one with both new iOS 12 and Mojave users. With only one other participant on the call, the new FaceTime retains a familiar view where you can see yourself in a small preview that floats over a window of the person you're speaking with. The primary difference in the new FaceTime 5.0 on Mojave is that the camera button used to capture a Live Photo is replaced with a button that presents your contacts, used to add additional users to the call. 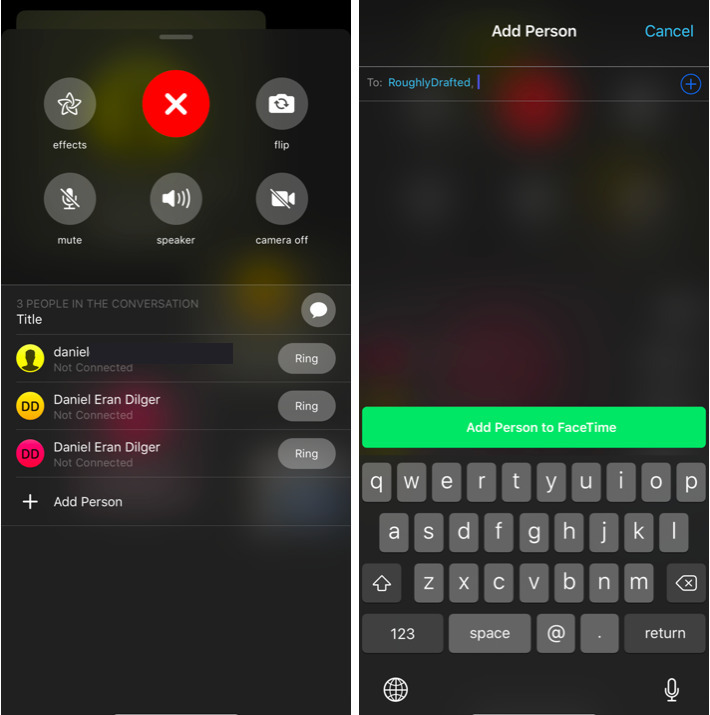 As you invite additional users, the first splits the view in half in a new FaceTime user interface (above) that presents your own camera preview below your two callers, in the bottom right corner. There are new controls that present the sidebar of previous and missed calls (or current call participants). It provides a familiar red end-call button, buttons for muting your microphone audio or turning off your camera, and button to take the call full screen (or return to window mode). As you add more than two other participants to your call, each becomes a floating box within the window. The new FaceTime will manage conversations with larger groups by automatically detecting the active speaker and positioning them prominently. You can also click on another participant to bring them into focus (depicted below on iOS 12, before and after clicking on the DD box). The user interface for this working now, even if multiple callers aren't yet working. Callers will also be able to join a conversation at any time; if you invite a caller and they don't initially respond, there's a "ring again" button to attempt to bring them on the call while it's in progress. During a call, new participants can also be invited. They then choose to appear in full video or audio-only. Using its integration with Messages, you can switch from a FaceTime call to a text conversation with the group. On iOS 12, the controls for adding new users to an existing call are similar. 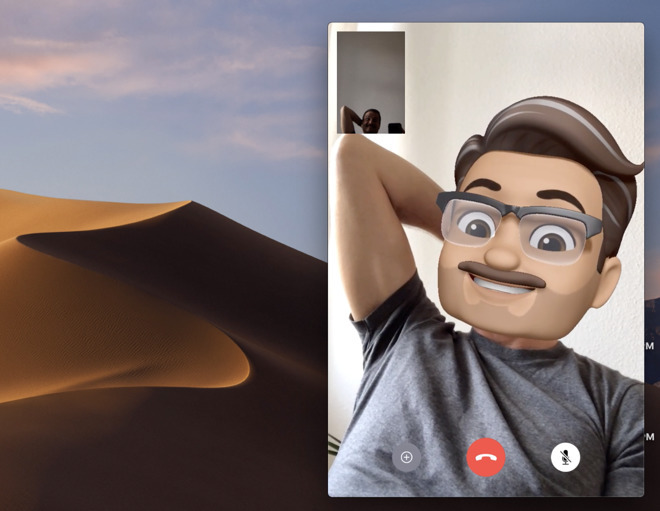 The Mac version of FaceTime on Mojave lacks the camera filters, video stickers and the face tracking Animoji (and custom Memoji) features available to iOS clients. Animoji is of course limited to iPhone X and its 3D face tracking TrueDepth camera, specifically, but you can see all of the camera effects applied by iOS users on your call from a Mac (below). The new iOS 12 FaceTime camera effects appear behind a new Effects button with a spirograph star icon. It pulls up an interface of icons that appear familiar to the tray for working with iOS Messages Apps. There an Animoji button for tracking one of 20 Apple-designed, emoji-based characters to your face, and you can also use any of the custom "Memoji" faces you create for yourself in the Animoji Messages App. 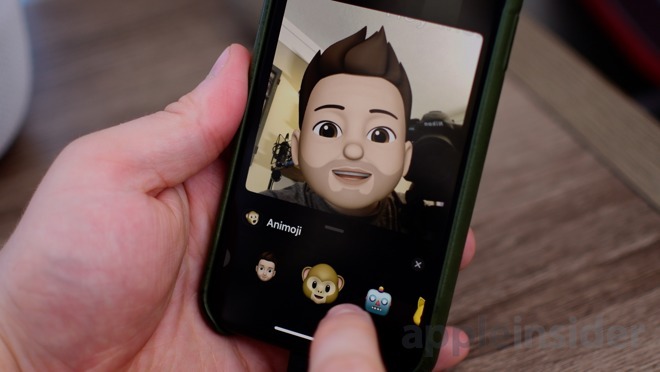 In FaceTime, Animoji and Memoji move beyond a cute animation for chat (and of course, karaoke) into being a real life avatar that uses Augmented Reality to apply a 3D graphics model to your face. The next button is for live video Filters, which are applied to your camera and (like Animoji) are visible to all other participants. This includes the same nine filters (Vivid, Dramatic, Silvertone, etc.) 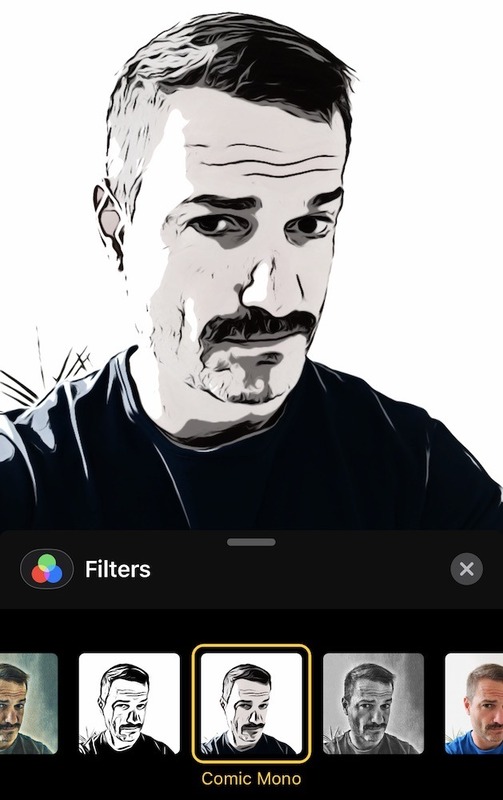 Apple has previously made available for the regular iOS camera, along with some additional new filters aimed reducing the self-conscious nature of video chats. These video-oriented filters include an image-simplifying Comic Book, a smudged Water Color, a minimal line art called Ink, and monochrome versions of the Comic Book and Water Color filters. You can stack these filters on top of other effects, such as an Animoji face. Additional buttons for Text, Shapes and all of the Stickers that you have installed for use in Messages Apps each let you place various artifacts in your video view using Augmented Reality. You can place a sticker or text label and it maintains its placement in 3D space as your mobile camera moves around. If it gets in the way, you can just drag it out of the view and continue. As Apple keeps finding new ways to use its Augmented Reality technology, it makes it clear why the company invested in AR: it's an important new 3D interface for moving beyond multitouch (which is inherently 2D taps on the display, even when using the hard press of "3D Touch") in the future. With iOS devices, AR presents "spacial" 3D controls for navigating a virtual view superimposed upon the real world. This isn't really practical on a Mac, which is too large to carry around as an AR "lens" you look through. Of course, in the other direction it will be even more useful once the ARKit technology on display in iOS is miniaturized into actual lenses you can wear right in front of your eyes. That's a ways off, but is clearly the direction Apple is working toward. 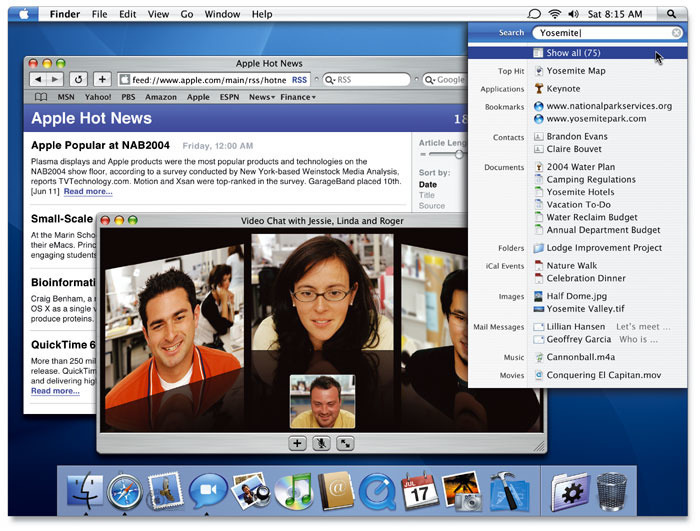 Prior to the first Mac release of FaceTime in 2012, Apple distributed a video-capable iChat app for macOS between 2002-2012, which eventually supported up to three other video participants (depicted below). Apple initially introduced FaceTime on iPhone 4 in 2010, and later brought it (and the iOS Messages app) to the Mac, replacing iChat. 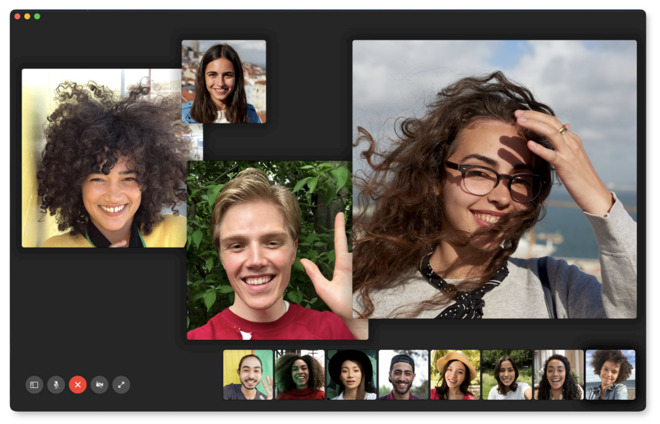 In that shift, Macs lost multiple-user video chat from Apple, but gained the ability to FaceTime with an iOS device. Other companies have provided Mac-compatible video-chat services that support multiple users. 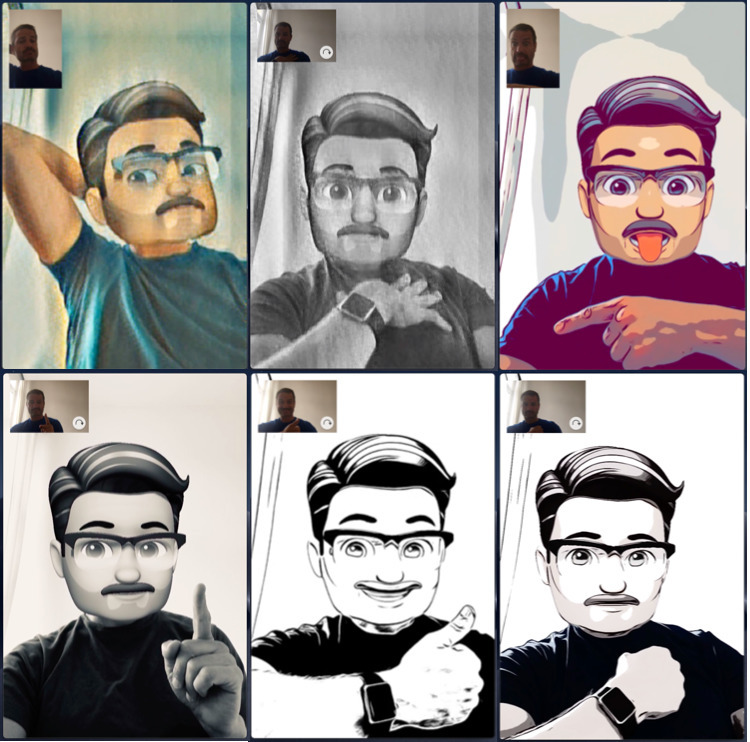 Additionally, some of the iOS 12-specific features of the new FaceTime initially debuted on the Mac in iChat, including video filters. So far, none of the new work Apple has done for Messages on iOS, including Apps, Stickers, Image Filters, and now Animoji, has made its way to the Mac. 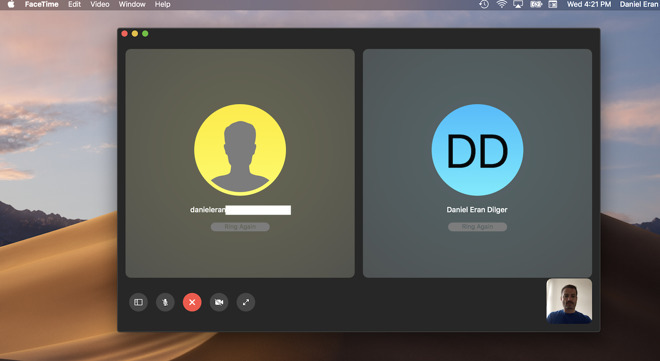 The macOS version of FaceTime is written in entirely different code and to different frameworks compared to its iOS version, and of course runs on completely different hardware. This might change in the future if Apple pursues a strategy of bringing more frameworks from iOS to Mac OS, helping to make its premium Mac desktop system capable of more of the things that it has newly built for the mobile world. To maintain the interest of its high-end Mac buyers, many of whom are also iPhone X users, Apple could also be expected to deliver new Continuity Camera features that enable face detection (and 3D imaging) on a Mac when used with a TrueDepth iPhone. Essentially: using iPhone as a sophisticated wireless webcam. FaceTime wouldn't even be the most obvious or valuable benefactor of this. Apple's blockbuster sales of iPhone X hardware (which deployed a TrueDepth camera to millions of users globally) give it a strong edge over other PC makers in delivering a premium electronic camera with unique imaging features that could be used with Macs in many applications, from remotely 3D scanning objects for analysis to modeling and prototyping product designs. Successive beta releases leading up to the official release of MacOS Mojave and iOS 12 should reveal new details about FaceTime 5.0 and Apple's new move into collaborative video chat, so stay tuned.